I slacked off a bit, but I've gotten back into planning things for this site (and beyond) in a major way. My notes of things to do is kind of bananas. However, my time remains limited and it'll be one small step at a time. For now, I've made many housekeeping improvements to improve usability and make way for the upcoming stuff I have in mind. One significant change was to rename the site as Vic's Video Game Collection (VVGC) and redesign some of the art. I figured there's no need to hide the fact that I'm the nerd collecting this stuff (and best not to just lift a character from the show considering FOX's penchant for sending C&D notices). Did you know websites are work? Because I was just reminded of how much time it takes to do this stuff. Anyway! There's a whole bunch of new game info added to the aptly titled Game Info section. There are all kinds of electronic games and interactive experiences that I'm sure CBG would include in any worthwhile collection. That means game cover scans, manuals, screenshots, and plenty of cool tidbits to while away your evenings. It's been a decade since this place got an update. 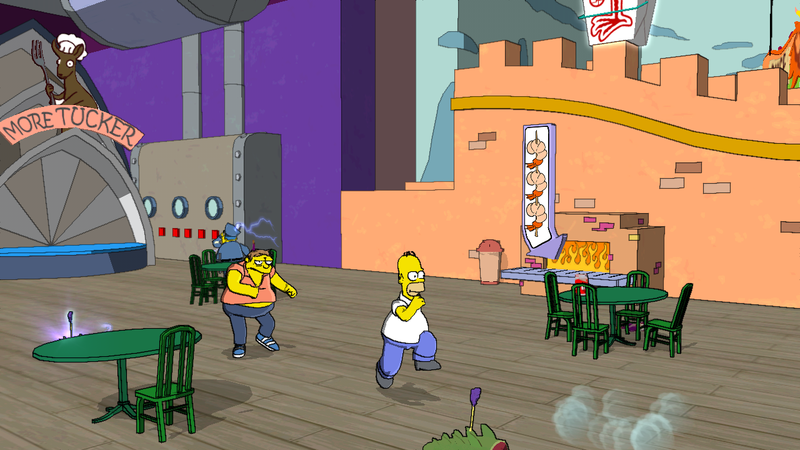 What's happened in the world of Simpsons video games? 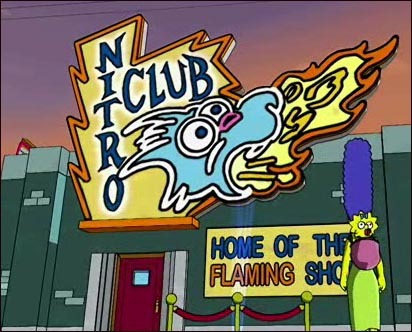 2007 - The Simpsons Movie ramps up its hype machine in the first half of the year and releases in July. 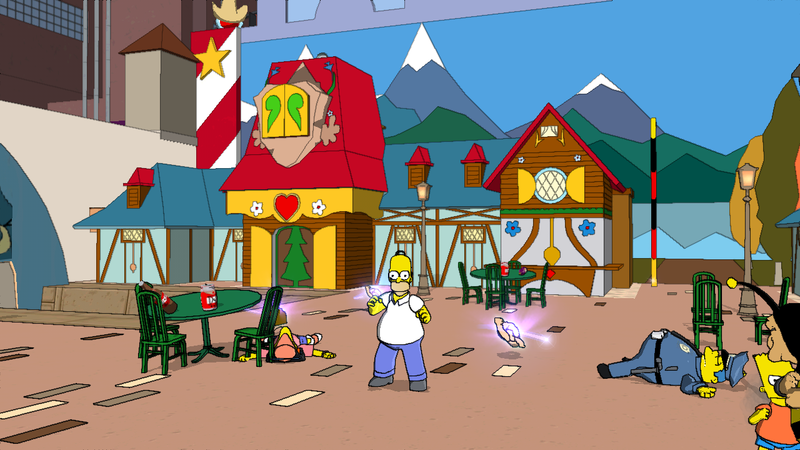 2007 - The Simpsons Minutes to Meltdown also releases in the summer as the first mobile game based on The Simpsons. 2007 - The Simpsons Game gets spun up alongside the rest of this Simpsons madness and finally releases on November 1st, 2007. 2007 - And to cap off an already crazy year, I get to work on The Simpsons Game and attend the launch party with an invitation from EA! 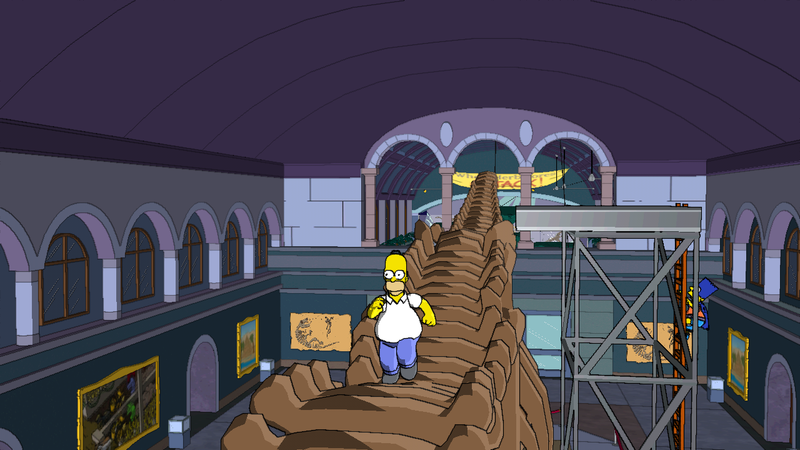 2008 - The Simpsons Ride first opens at Universal Studios Florida and then Hollywood, allowing park visitors to go an on interactive joyride through Springfield. 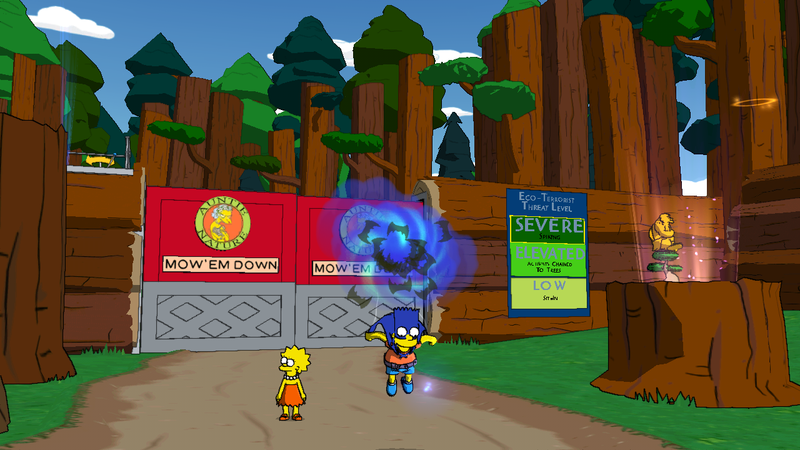 2009 - The Simpsons Itchy and Scratchy Land releases on mobile platforms featuring similar gameplay to Minutes to Meltdown. 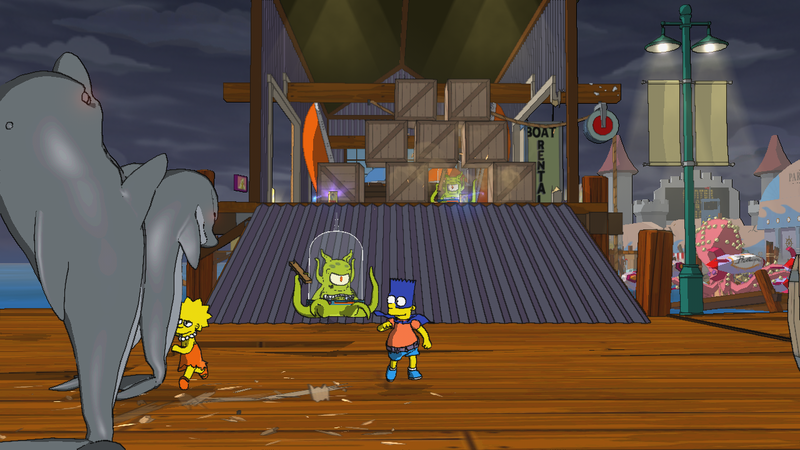 2009 - EA releases their first Simpsons game on iOS by remaking The Simpsons Arcade, a modern take on the classic brawler. 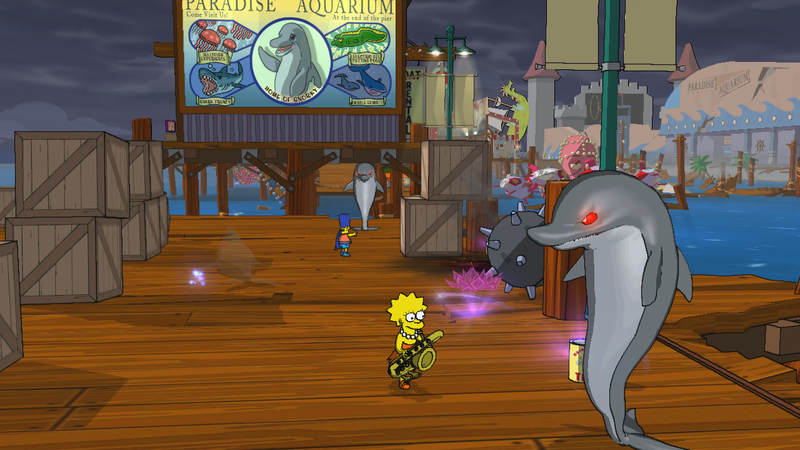 2012 - Konami strikes a deal that allows them to re-release an updated version of the original The Simpsons Arcade game onto Xbox 360 and PlayStation 3 platforms. 2012 - After a rocky start, EA releases a tap-happy take on monetization with The Simpsons Tapped Out on iOS and Android. The game rakes in all the money and EA decides it's going to sit on that cash cow for some time. 2014 - Konami pulls down their re-released versions of the The Simpsons Arcade when they lose the rights to the game. 2015 - A Simpsons character pack is released for Minecraft on Xbox 360 and Xbox One. 2015 - And then the Simpsons join the franchise madness of Lego Dimensions. 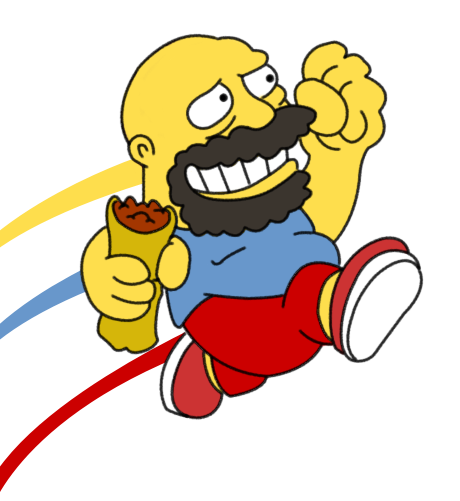 2015 - Yours truly embarks upon a crazy quest to play every Simpsons video game in a 24-hour marathon for charity. 2017 - begins releasing micro episodes in which the gang discusses various Simpsons games of yore. They also post a fascinating interview on Simpsons game history with former Acclaim and Fox Interactive producer Paul Provenzano at the Talking Simpsons Patreon. 2018 - Rupert Murdoch sells most of 21st Century Fox's entertainment assets to Disney, including full rights to The Simpsons and Simpsons-related paraphernalia. And that's all the news I've got. I'll be expanding the site with new info and other goodies over time. Feel free to poke around in the meantime or check out a shotgun blast of content at this place's official social media presence: noiselandco.tumblr.com. The guide for The Simpsons Game has now been completed. You can check out version 0.9 of the guide at the game info page or game guides page. It's that time of year, folks. Your loved ones (or people you feel obligated to give a gift to) are expecting some nice stuff and if they have even the slightest affection for our favorite yellow family then you should make sure to check out the latest wares at the Simpsons Shop. You can drink a pint, place the ornaments on the tree, hang the stockings from the chimney with care, and then carry all your gifts on your way back home. The officially unofficial guide to The Simpsons Game has now been released. You can check out version 0.3 of the guide (covering everything in the game up to the Mob Rules episode) at the game info page or game guides page. Tired of looking at your boring ol' game system? Fan of the Simpsons without anything new to buy? Or maybe you're just someone with time and some spare cash lying around? Boy, have I got the solution to your predicaments! Check out the all-new Simpsons skins at the official Simpsons Shop which you can order for any of the latest game systems such as Xbox 360, PS3, Wii, and Nintendo DS. You can also order skins for your phone and music player if you feel like you need to floss the Simpsons everywhere you go. 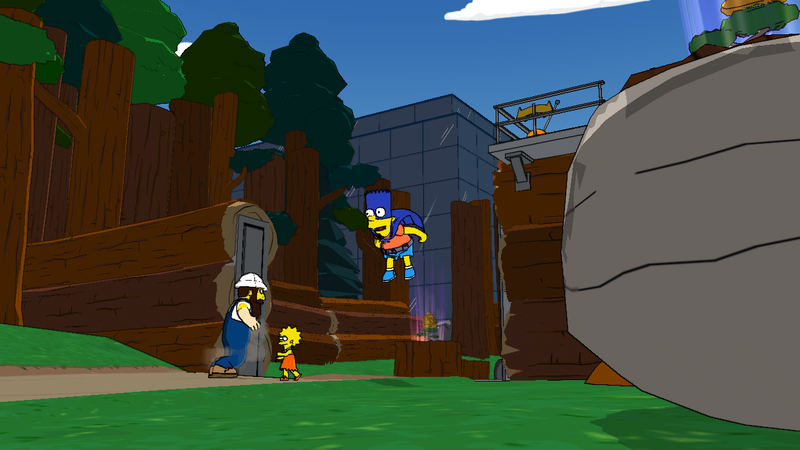 It's been a long 4 years, but the deed is finally done: a new Simpsons video game is in stores! Go pick up your own copy on Xbox 360, PS3, Wii, PS2, PSP, and/or Nintendo DS. For those who missed the launch celebration last night at Universal CityWalk, check out a recap thread and photos at nohomers.net. You Simpsons nuts out in L.A. have a chance to celebrate the release of The Simpsons Game by joining in on the Game Launch Celebration at Universal CityWalk. And, because they know we love it: free stuff! Check out the details. A guy at everyone's favorite Simpsons community, the NHC, recently posted his impressions of the upcoming The Simpsons Game which was set up for gamers at the E for All event. Check out his write-up of the game and fan reactions. Did you ever wonder what would've happened if those rude Germans hadn't interrupted Homer's escapades in the Land of Chocolate? ... What do you mean "no"? Bah, who asked you anyway. Click the pic for a beeeoooteeful HD cutscene from the Land of Chocolate level in The Simpsons Game, courtesy of the fine folks at EA. It's out! All of youse who own an Xbox 360 better be out there either downloading The Simpsons Game Demo from Xbox Live Marketplace or playing it right now. What, you think I'm kidding? GO, GO, GO! That's right, folks. 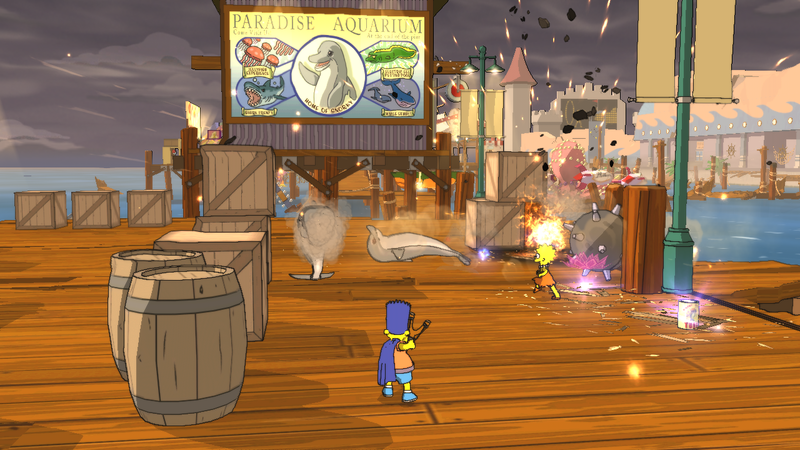 You lucky PS3 owners can now pay a visit to the PlayStation Network Store and download the official demo for The Simpsons Game. Yours truly doesn't own a PS3, but something tells me that Xbox 360 owners will be seeing a demo as well. At least I hope so. 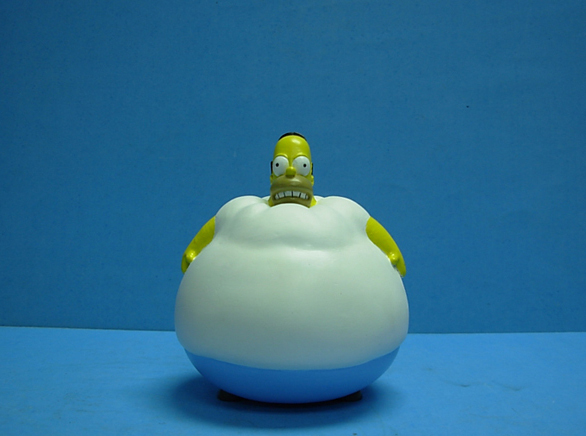 Homerball refers to Homer's special turn-into-a-fat-ball-and-crush-things ability from the new Simpsons Game. And when you pre-order the game from select retailers (read: Gamestop), you too can roll like Homer by receiving the Homerball pre-order item. Wait, it gets better! EA wants to see your Homerballs in action in the form of photographs. Homerball at work, Homerball on a roller coaster, Homerball in your dog's mouth... well, that last one might not be ideal, but you get the point. Check out the Homerball page at ea.com and look around for all the other awesome web pages they've put up for some of the levels from the game. 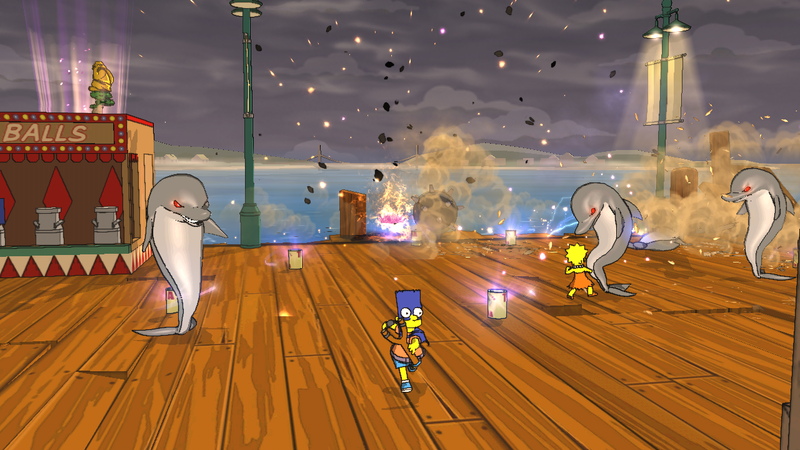 What happens when you piss off a lot of dolphins? Take a look. Anybody else wanna be a hero and mess with my pretzels!? See, Bart? This'll happen to your spine if you don't sit straight. Hey Bart, what're you... oooohh, did you just cut the heroic cheese!? Ok, Lisa. You fight, I'll glide a few feet above the ground. We're a perfect team! You'll pay for stealing my shrimp... *BURRRRRRP*. The official Simpsons Website has been updated once again with a snazzy yellow and white design, plus a ton of info and media for our gamer eyes to behold. There's a nice blurb about the recent EA Media Showcase where media types got to check out a few levels from the game. Visit the good folks at nohomers.net for a nice write-up about the event and the current state of the game. First and foremost, we have release dates! 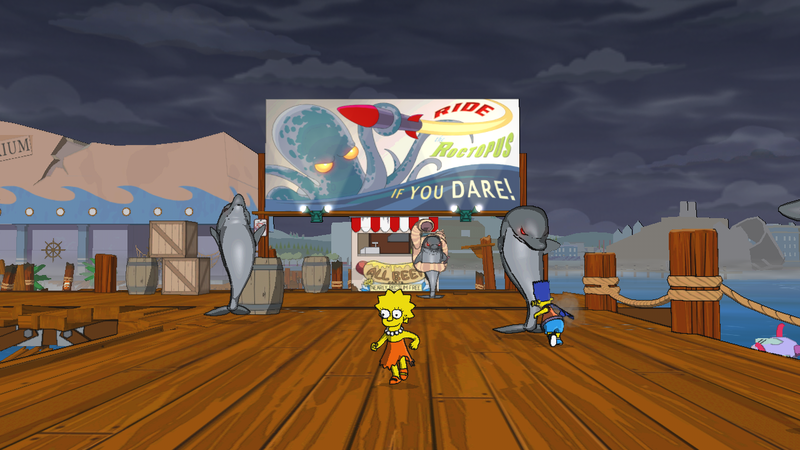 The Simpsons Game for Xbox 360, PS3, PS2, and Wii is set to release on October 30, 2007, while the PSP and DS versions of the game release a week and two weeks later, respectively (per Gamestop). On to media news, the latest trailer for The Simpsons Game from EA features The Scorpions' Rock You Like a Hurricane in a very GTA-esque series of gritty street scenes. Get an eye full of angry citizens, Itchy pimps, and other whacked out characters from the new game by clicking the link below.